I had not used the good old Wake On LAN option in a while, until my brother-in-law (Jean-Pierre) was looking for something like that to wake up his NAS. Most of the Wake On LAN applications I found for him were just too extensive, too complicated, or not free. I wanted just a simple menu in the System Tray (Windows: next to the clock, lower-left corner of your screen) or Menu-bar (MacOS X – top of your screen). Well, after quite a bit of searching I could not find anything suitable or to my liking and I decided to just write something myself. Timing couldn’t be better, since I just wanted to implemented Wake On LAN in another application – ConnectMeNow (for MacOS X). Reusing the code, making it suitable for Windows and MacOS X, and wrapping it in a small application was done relatively quickly. This application has been tested under MacOS X 10.11 (El Capitan) and Windows 10 and it’s FREE. There is a new version available of miniWOL which is recommended over the version on this page. Wake On LAN, or WOL, is a Ethernet standard that allows you to “wake up” computers or network devices that are in stand-by, and is originally intended for use in a local network. WOL is probably most commonly used to wake up a server or NAS, just before access to these machines is needed – for example a media server, which can sleep all day long until you want to watch a movie. There can be several motivations to do this; save on power, save on wear-and-tear of your equipment, etc. WOL also requires the network card of this device to be semi-awake, and still listen to traffic, just in case a “magic packet” is being send to the device. While the NIC (network interface controller) is listening, a lot of traffic might pass that might not even be intended for this network connection, so just listening to network traffic would keep your network device awake even when you don’t want it to be awake. Note that theoretically WiFi supports Wake on Lan as well, however … not all computers and operating systems support this, so you milage may vary! The magic packet is a 102 bytes long broadcast frame containing a of payload 6 bytes, all set to 255 (FF FF FF FF FF FF in hexadecimal), followed by 16 repetitions of the target computer’s 48-bit MAC address. To prevent that just anything can wake up such a network device, a very specifically formatted “magic packet” has to be send over the network. Naturally, you can guess that this is not 100% fool proof, but it’s better than nothing, and in your local network (at home or in the office) this might be safe enough. Note : As of version 1.2, miniWOL supports subnet directed broadcasting. This technique does seem to be required for some devices to work with WOL. This is unfortunate, since broadcasts aimed at a specific device (unicast) appears more secure than subnet-directed broadcast. See also these 2 Microsoft Technet articles: About Subnet-Directed Broadcast and Choose Between Unicast and Subnet-Directed Broadcast for Wake On LAN. Before we can wake up a network device with WOL, you will need setup this device to do so. Quite often you’d need to do some settings in the “BIOS” of your computer, and do some settings in the operating system as well. Certain devices, like most NAS devices, make it a little easier by offering a simpel “WOL ON/OFF” function. Since this will be different for most devices, either consult the manual of your device, read an online guide like this one at How-to-Geek, or consult Google. miniWOL, and Wake On LAN in general, is intended to be used in a local network, meaning: wake up a network device in the same network you’r in (at home or in the office). To wake up a device at home, over the Internet (ie. you’re in the office or traveling), will require some trickery including, but not limited to, port forwarding. Not every modem/router can even do this. An example can be found here: DD-WRT. So by default: use miniWOL for devices in your local network. For waking up devices over the Internet, you will need to do some extra leg work to get everything configured correctly. The intend of miniWOL is to have a small icon in your SysTray (Windows) or Menubar (MacOS X), where you can send a Wake On LAN magic packet to a defined server. All this without thinking or seeing all the in-depth details (once you’ve configured it right). miniWOL has been reviewed by SoftPedia as safe. Installation of miniWOL is straight forward. miniWOL is a 32 bit application, which should work on any Windows version, starting with Windows XP and up. The easiest way to install this would be just running it from your Downloads folder or Desktop, but it can be done a little cleaner. Right click “miniWOL.exe” and choose “Create Shortcut” – this will create a shortcut, most likely on your Desktop. For MacOS X, this has been tested with Mac OS X 10.11 (El Capitan), but I suspect it will work on any Intel based Mac. Sorry – PowerPC is not supported. Unzip the downloaded file and drag the application into your “Applications” folder. miniWOL is almost identical for Windows and MacOS X, but there are minor differences as can be seen in the screenshots below. The Windows version allows you to select a different icon for your SysTray, where as the MacOS X version determines if you’re running the normal MacOS X theme or the so called “dark theme” and adjust the icon based on that. 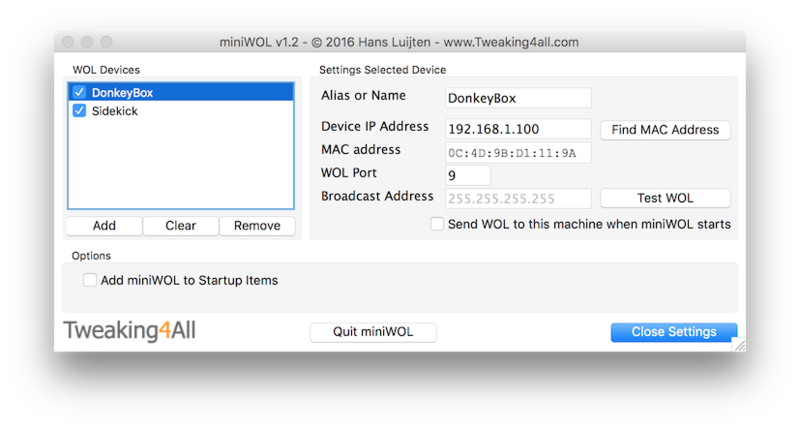 You can set miniWOL to start automatically when starting Windows or MacOS X by checking “Add miniWol to Startup Items” (Mac) or “Auto start miniWol when Windows starts” (Windows). To add a server, click “Add” and select the added device in the list. Device Address – This can be the name of the server, but the IP address is prefered. Typically port 9 (UDP) is being used for WOL, so when you’re not sure, start with port 9. Some devices actually seem to see that as a “shutdown” command, and in those cases you could try port 7. If you know what you’re doing and you’ve defined your own port number, then you can set that one of course. Obviously, with “Remove” you remove the selected server from the list, and “Clear” will remove all servers from the list. The checkbox in front of the server name (in the list) determines if a server is listed in the menu when clicking miniWOL in the Systray (Windows) or Menubar (Mac). This way you do not have to delete a server in case you do not want to see it all the time. All settings are saved automatically, so there is no “Save” button. miniWOL is easy to uninstall, simply remove the application by deleting it (miniWOL.exe under Windows, or miniWOL under MacOS X). There are 48 comments. You can read them below. Just what I was looking for! Thanks Hans! Thanks John for taking the time to post a “Thank you!” – it’s much appreciated! Hello Hans. Thank you for creating and sharing miniWOL. I just downloaded it (the macOS version) and I found it is just what I was looking for. It works flawlessly in macOS High Sierra 10.13.3. Thanks again. Also good to know it works well on 10.13.3 as well – I originally created the app for my brother-in-law and hardly use it myself. found your miniWol Tool and it is working perfectly on 10.10 Yosemite. P.S: You wrote the tool is your brother in Law. I use miniWOL to wakeup my NAS. Wouldn’t it be better to set the default Broadcast to something like 192.168.X.255 ? I believe most people have a Class C Net at home. But it is just a minor scratch on this fantastic tool. Again, Thanks. Thanks for taking the time to post a compliment and a suggestion! It’s much appreciated. Awesome to hear you enjoy the application. The 10.x.x.x and 192.168.x.x ranges do seem to be the most common of the 3. So pre=populating (I assume this is what you mean – please correct me if I’m wrong) might be convenient to some, and inconvenient to others. because every defaul depends on IP an subnet. in the config – window. Btw, tested your ConnectMeNow too, another great Tool, thank you. With ConnectMeNow (I’ll reply to your comment there): Make sur to give the beta (v2) a try – quite a few things have improved. p.s. feel free to email me at webmaster at tweaking4all dot com if you have suggestions so we can talk more about the details. I haven’t worked on miniWOL for a while, but I think it may need an update for Mac anyway (64 bit, signed, etc), so I would be able to add some small functions if they add to it’s usability (I would like to keep the application as simple as possible though). Awesome tool, I use it on Mac and Windows. But there seems to be a problem with Windows 10 recently. Doesn’t work any more. The guy suggested to change the broadcast from 255.255.255.255 to the IP of the destination PC. That sounds weird but it happend to work for me. But then it stopped working again. Changing back and forth on my PC did not solve the issue. Then, on the laptop, I had the exact same problem! Then I deleted all entries in the broadcast field and it suddenly worked. I don’t know if this behaviour makes any sense. But since a lot of other people also seem to have similar issues I wanted to post it here. the broadcast on 255.255.255.255 should be the default in miniWOL. I did write this program originally for my brother-in-law, since I no longer use WOL for anything. I’ll try to do some testing in the next weeks, once I completed one of my other projects. I need to make a setup to test WOL. I also noticed different WOL behavior amongst different devices. For example QNAP implements WOL strict and it always seems to work, whereas Synology is not using the standard all that well and requires a 255.255.255.255 broadcast. I’m in the middle of migrating all my applications, mostly for macOS, so miniWOL will get some attention as well. If only Apple and Microsoft would stop making things so darn complicated (security, signing, etc etc etc). I am pretty sure my problem was related to Virtualbox (and its network adapter). Once I removed the program from my Win10 (not just the virtual machine itself) miniWOL works again. Regarding the Linux – I am using Lubuntu a lot. Is is a leightweight version of Ubuntu and miniWOL fits perfectly into this setting. So, if you want to do this and need some support, maybe the maintainers of Lubuntu and its packages might help you out. I am not an expert in the field. Could it be that VirtualBox implements a “virtual switch”, making a virtual LAN on your PC, not allowing (or even blocking) the magic packets? I’ve started working on a new version of miniWOL, and hope to have it done within the next 2 weeks (got travel plans after that). I’ve played with Lubuntu, pretty neat. I’m more partial towards Mint and have seen folks using KaOS. It would suit such a setup for sure – still tinkering with how to get an icon in the “systray” (forgot what it’s called under Linux). I am not sure about the icon in the systray. For my linux I made a .desktop file, put it in /home/USER/.local/share/applications (i guess), put an icon.jpg somewhere and an wol.sh file somewhere, too. I then put this starter file (.desktop) onto my panel. The command inside the wol.sh is “wakeonlan IP”. Wakeonlan is a command-line tool. Now that I thought about all this I think this is already so easy to use it is probably not worth programming an extra thing. At least for me. I am just waking one single machine all the time. :) You probably know all of this anyway. I use Lubuntu and it has a panel. I don’t know if other version of Linux use a panel this way. A .desktop file (program starter) is a pretty normal thing in Ubuntu at least. It is not a systray thing, though. In Lubuntu, I use autostart in the LXPanel Settings (or something called like that). For example F.Lux GUI is an application that uses the via autostart. This element now is part of the autostart setting in Lubuntu and I can activate and deactivate it there and also I can put commands there that get autostarted. I never used the autostart-directory and I am unsure if it works. Apart from that using a .desktop file in the panel (in Lubuntu) does not require beeing autostarted. Once it is part of the panel it is displayed there alongside all other starters as default. This does not mean that a program (or deamon) is running. A starter (.desktop file) is just a graphical mean of starting a program (in this case my wol.sh) and every time I click on the starter the wol.sh gets executed. Sorry if this also is something you already knew. I suppose you try to implement it the way it is done in Windows and Mac. As I said, F.Lux GUI uses a systray. Telegram Desktop does, also. So does Franz. Maybe you can find out how they work. Thanks Ben for the info! I’ll have to tinker a bit with that. It seems that ~/.config/autostart/myapp.desktop seems reasonably standard amongst Linux distro’s, just not sure why it is not working on my Mint setup. Oh well, I’ll figure it out I hope … the new version is almost ready, and just hinging on this part. Just for confirmational sake: The reason miniWOL (and others) is unable to send WOL packages is definitely the “Host-Only Netzwork Manager” inside of Virtual Box (or maybe the settings with which it is set up). Once de-installed, everything works fine again. Thanks Ben for the confirmation! I kind-a figured something like this would be the problem (not knowing the details – so thanks for shedding a light on it here). I am sure the “fix” will be useful to other as well. Awesome Ben! Thanks for posting! Others will hopefully benefit from this experience. Finally I found your tool. I use it on Mac. Runs fine under high sierra. Could you put a checkmark in settings that will quit the tool automatically when all wol calls are send? That’s actually not a good idea! In the next version I’ll add this option – close miniWOL after all WOLs have been send. 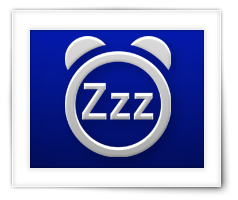 This way folks can add multiple devices to be waken. It may take a little for me to make that change (since I’m migrating it 64bit and signed for MacOS, and I do have some more projects listed for the same treatment). So if this option would be available and checked (activated); how would a user get into miniWOL to make changes? After all; the application starts, executes the WOL commands, and … closes. Each time. I’m looking into options (ie. keep Shift pressed while starting, or when miniWOL is not auto started) but none of the options so far are easy to implement cross-platform. Adding a command line parameter would be an option, but this would make the application less user friendly (again; no good cross-platform to add this). Since most users will not use this option, I’ll implement a command line option “-q” and “-quit” which will close miniWOL after sending WOL to the selected servers. This way, the very few that like this option, can call miniWOL like so: “miniWOL -q” (or “miniWOL -quit”). Haven’t thought about that…. Usually you would have a service that would do the job and then quit afterwards, if configured, and a separated configuration app. But in this case that would definitely be an overkill. On the other hand, on a mac you now need to have a script that autostarts the application with an command line option, or is there a way to do so right from the login items? You bring up a good point for Mac users … hmm, didn’t think about that. Maybe I can find a way to determine how to application was started. Allow auto quit when started automatically, and not use auto quit when started manually. Just not sure if there even is a method to determine this (kinda doubt there is a way to see this). I did consider an option like keeping Shift or something pressed for a “Safe mode” start. I’ll have to dig into that one. By the way version 2 is pretty much done, except for this little issue and creating distribution packages. How about an timeout, maybe 10 seconds should be enough, if in between those time somebody starts the GUI the quitting is canceled. Alternatively you could detect when miniWOL was launched last time so if it is the second start within a minute the quitting is not performed. That also would be natural, if it starts and vanish what would you do? I was thinking something like that as well – the time out. Maybe give a little more than 10 seconds, maybe 30 seconds or something like that, since miniWOL would start during login, the user may not make it in time to open it. I think I’ll try that route. I tried the “press shift” when starting the application but this will not work under Linux, and I’d like the application to remain uniform amongst platforms. OK, implemented that option, and set the time-out to 10 seconds (which starts after Wake On LAN has been send to the designated network devices). Long enough for a user to react, and if they failed, they can still just start miniWOL by double clicking the app and then go into the settings menu to make changes. Since I’m traveling, I cannot test anything yet … if you’re interested; I can prepare a beta to play with. A beta would be great. I would test it on my macs and let you know, if something doesn‘ t work. Just uploaded a release candidate for macOS (link). If you (or anyone else for that matter) would like to test other platforms; let me know, I have one for Windows and Linux as well. just installed the 2.0 version. When I started the app I had three entries in the server list. They all made no sense and when i added a new one they became empty means with no text in it. My old server entry wasn’t taken over. I have cleared the list and put my server back in again. The application will not quit from itself, it stays in the taskbar and is also visible as a process. Only when I go to the menu and click on settings… then the icon disappears and the process is also removed. I also figured out that when I switch forward and backward the desktop the application will quit as well. If you provide an other version I can have a lock again. It could be that it’s picking up your old configuration. I tried to incorporate that, but since I’m not using miniWOL myself, I didn’t have much reference material … so that may explain the goofy initial list. As for automatically quitting; Once you’re opened the settings window, the timer will be killed and not restarted until you completely close out of miniWOL and restart it (assuming you checked the Auto Quit option – more details here). I’m just now noticing the bug with closing in 10 seconds. Interesting. I’ll have to take a closer look since I had no issues with Windows and Linux as far as that goes. Maybe I goofed up. I do like the “miniWOL will shut down in 10 sec” notification! I’ll incorporate that in the next release! OK, I can confirm that there is something funny going on with the Mac version. Looks like the application is “halted” when minimized, which prevents the time from terminating the application (and why it the closes when you click the icon after 10 seconds). I just uploaded v2.0.1 for MacOS, you’ll find it in the article for miniWOL 2 – This is the link to the download section. Please test and if you still run into issue, please post them there (since this page is geared towards the old miniWOL). Thanks for testing and reporting, it’s much appreciated. Is there a way to quickly import/export the setting? we would like to share this tool with our staff and provide them with a prepoluated list of PC to WOL without having them manually add each one by one. I’m guessing i could export/import the registry for windows? where are the registry keys located? How would you do it for MAC though? yes, there are several ways of share the config. It’s stored in an INI file. Just copy the ini file in the same location (with different username of course) on the other computers before starting miniWOL. i have already installed miniWOL and configured also, but when i did a test it does not wake up the server. Is there any configuration that need to be done on the server. First off all – you may want to look at the newer version (here), even though it doesn’t answer your question. Now as for the settings on your server; yes you will need to enable Wake On LAN on your server as well. The settings depend greatly on the hardware and the software on the server. A few examples of how to enable Wake On LAN on your server can be found here.